There just aren't that many sundew hybrids. In part it's because of the genetic diversity in the genus. 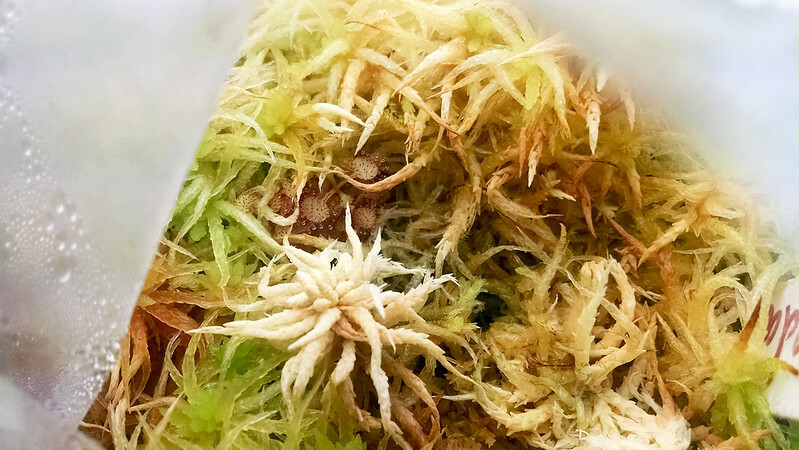 As much as one might wish to cross Drosera burmannii with Drosera cistiflora it's just not going to happen – Drosera species can only be crossed with relatively close relatives. Sarracenia and Nepenthes species, on the other hand, can all freely hybridize and produce fertile offspring. Another limiting factor is that sundew hybrids are, broadly speaking, boring. Compare Drosera ×tokaiensis, probably the most well-known sundew hybrid (Drosera spatulata × rotundifolia) with Sarracenia ×catesbaei, one of the most common Sarracenia hybrids (Sarracenia flava × purpurea). To the untrained eye the two parents of D. ×tokaiensis are almost indistinguishable, while the parents of S. ×catesbaei are strikingly distinct. Morphological difference between parent plants is the most basic element in making an interesting hybrid. 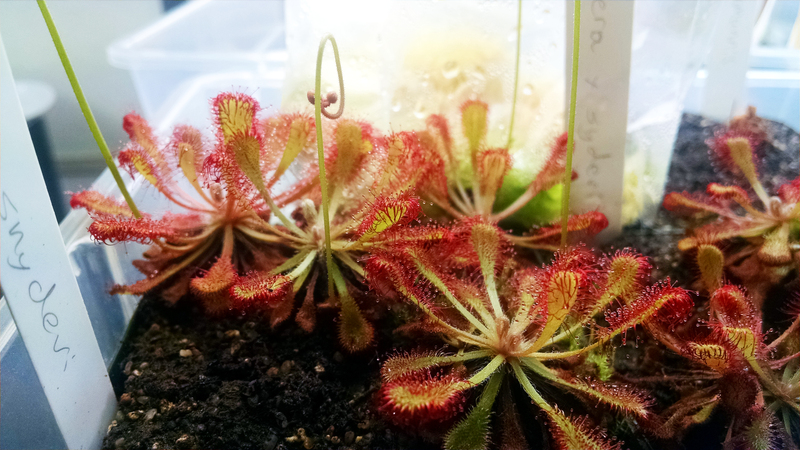 Anyway, I started thinking of all this when I took this picture of Drosera ×snyderi to show to my friend Josh. It took these plants a bit to settle in, but they're looking good now (aside from the aphid spraying). D. ×snyderi is the unpublished, botanically invalid name for Drosera dielsiana × nidiformis. It's a pretty good-looking plant, really, and actually produces viable seed. It was created by the mad scientist of Drosera hybrids, Ivan Snyder. Right nearby is this highly desirable hybrid, Drosera ×"Andromeda". Another unpublished name, this one indicates Drosera schizandra × prolifera. This plantlet is the one I started directly on the moss. The cutting I started in water and then transferred to the moss seems to have withered. Another data point against the water float method for me – transfer to media seems to really mess with the plant. 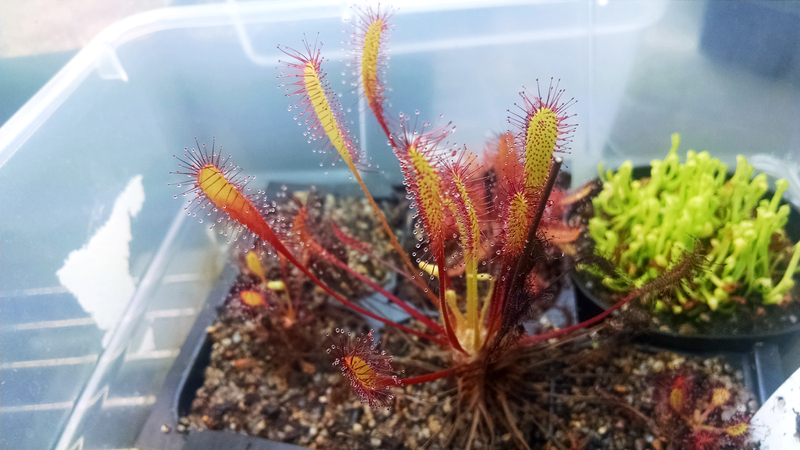 Some sundew hybrids are really fantastic, such as this Drosera ultramafica × spatulata. This hybrid really snuck up on me to become awesome. This pot got 3rd in Sundews at the recent BACPS show. It's a beautiful bright red, even with regular feeding. I had thought that this was a sterile hybrid but I was wrong! There are plantlets all over my collection now. 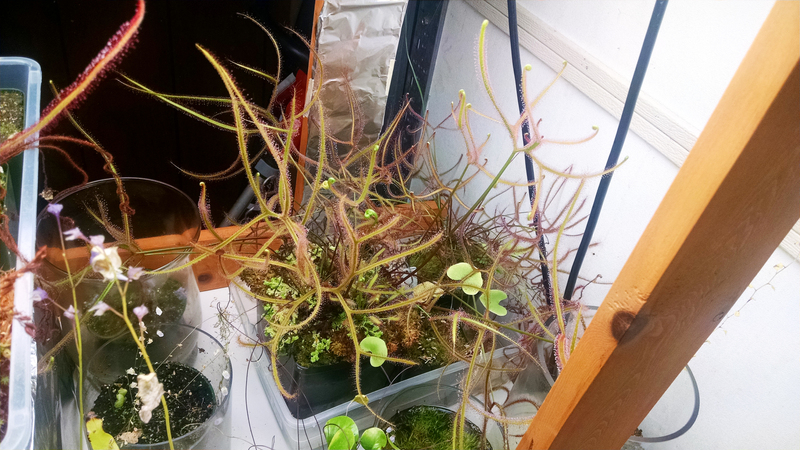 The only rival the above plant has for redness in my collection is this Drosera ×tokaiensis, the "×" symbol signifying a man-made, rather than natural, hybrid of D. spatulata and D. rotundifolia. This guy has been sadly ignored on the blog heretofore. This plant is a darker, more maroon red color, and is in fact sterile. In case you're curious, by the way, you can make the × symbol by holding the ALT key and pressing 0-2-1-5 on the numpad in that order. The natural D. tokaiensis is not quite as red, but it sets seed and has a charm all its own. The Community Pot is one of my oldest groups of sundews. I've definitely neglected the Community Pot lately (I lost Drosera allantostigma, alas), but it's just been chugging along. Need to trim those flower stalks though. 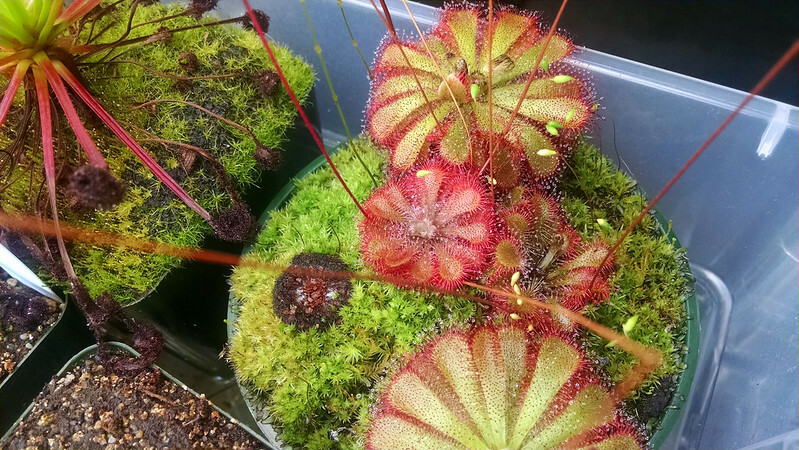 I also have some pygmy sundew hybrids! 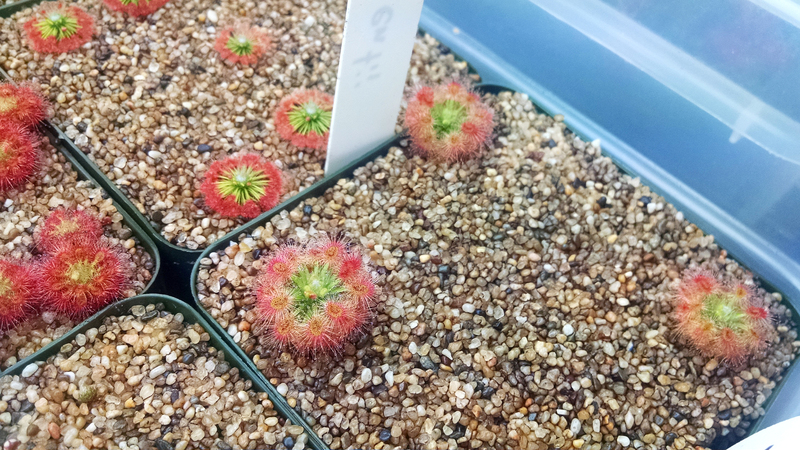 The first, Drosera ×Dork's Pink, indicates Drosera lasiantha × callistos, a man-made hybrid that was published in a recent issue of the CPN. A pretty plant with a silly name. For my money this is one of the prettiest pygmies going. The dew isn't as stunning as usual because I recently sprayed for aphids, but the color is wonderful. 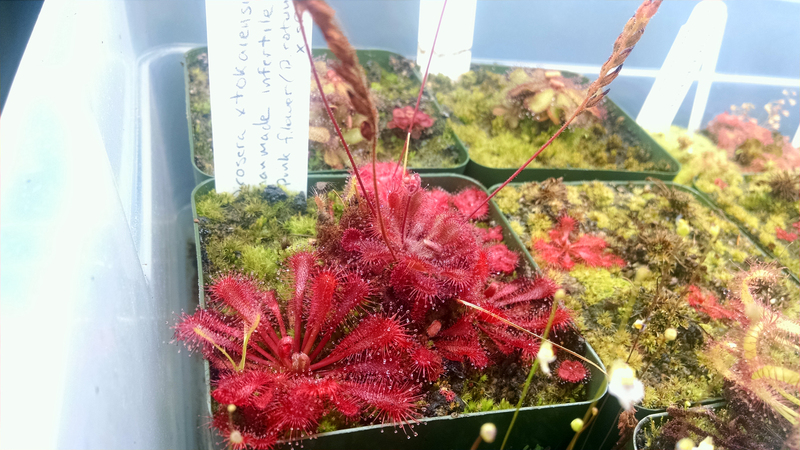 There's also Drosera ×carbarup, a naturally occurring D. occidentalis × platystigma. These are showing a bit of aphid damage unfortunately. There are several widespread pygmy hybrids, in fact. I tend to shy away from hybrids as a general rule, so I've yet to acquire most of them. This one is very nice though! 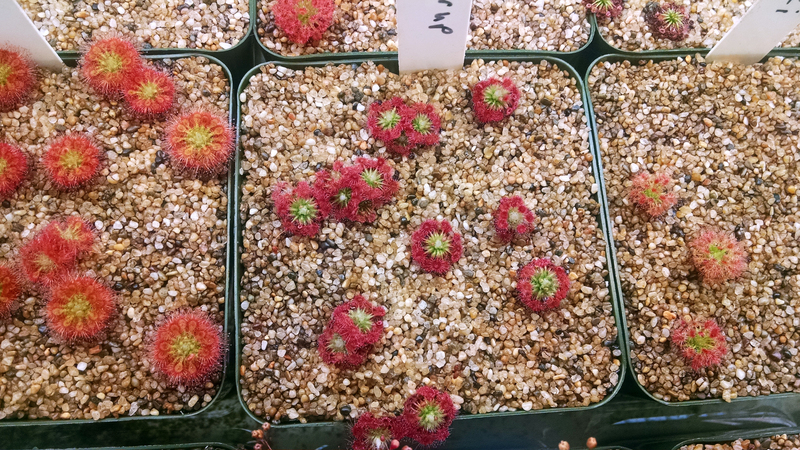 One of my favorite hybrids is another Ivan Snyder creation, Drosera anglica CA × HI. Got extra plantlets to spare too! This plant mixed the large, robust, but dormancy-requiring California form of D. anglica with the tropical, dormancy-free, but small and fragile Hawai'i form. The result is one of the prettiest plants in my collection. This is one of my absolute favorites. 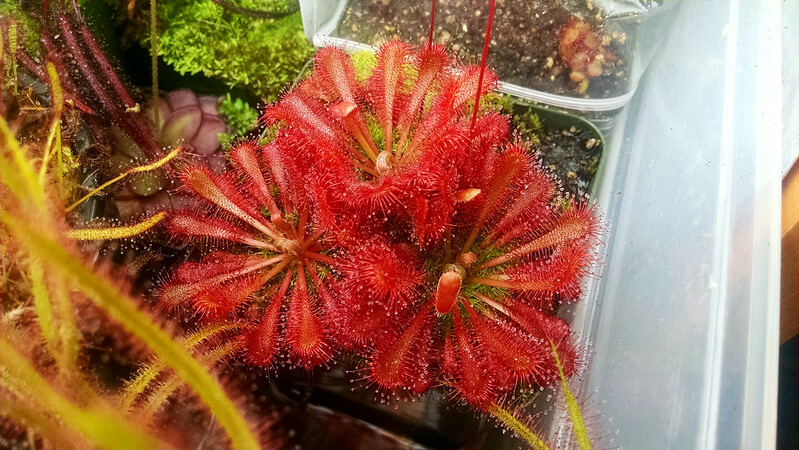 Finally, if I'm going to include D. anglica CA × HI I have to include Drosera 'Marston Dragon', which is a hybrid of Drosera binata dichotoma "Giant" with D. binata multifida extrema. That's a lot of plant. The botanical validity of all those names is in doubt, by the way. But there's no doubt that this is a huge sundew. I need to do something about it. Interesting information and fabulous specimens! I don't like hybrids myself, either. I wish ultramafica x spatulata was just ultramafica, and that esterhuyseniae x slackii was just esterhuyseniae, especially since the species in front are so rare. There's a lot of hybrids of the petiolaris Drosera too.